Enjoy celebrity look with our new collection of stylish party jewelry set. 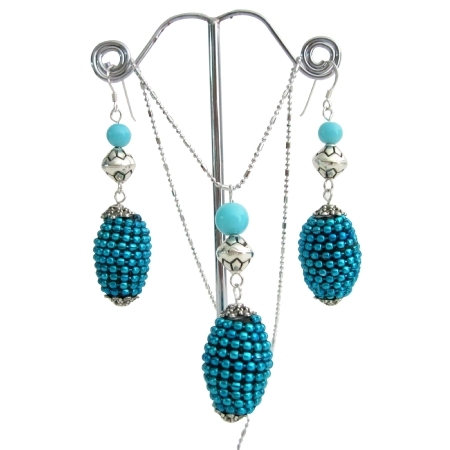 Handmade beads ethnic Kashmiri beads embedded with blue beads all over oval shaped bead with bali silver spacer & turquoise pearls accented in beautiful designed rhodium quality chain with matching sterling silver 92.5 earrings. The main beauty is the lot of craft work embossed & dress up with many accessories this fashion jewelry is a must have for fashion savvy this beautiful set perfect for gift or for yourself or for any occasion.